Kicking off your first chapter of adventure is La Bonne Table. An epitome of the marriage between traditional French and Italian flairs, you can expect a wondrous medley of rich flavours bursting at this chic diner. While here, wine and dine with the decadent Duck Confit, a dish so tender the meat falls off the bone. Close your eyes, savour the perfectly-executed dish, and feel the sparks fly in your mouth. Wanderous (foodie) spirits, rejoice. You’ve just found your soulmate. Cha Cha Ko, born out of the same name as its free-spirited chef, takes culinary adventures to new heights. Be part of Cha Cha Ko’s quest for global food diversity with novel palates and eclectic sensations. The fusion plates here are distinctively unique from their recipes, execution, and presentation. Never will there be a dull moment at Cha Cha Ko, where global culinary traditions are celebrated and harmoniously melded together. Adventure may sound daunting to some of you. Fret not! Regardless of the dish’s nationality, mouth-watering and homely experiences can be expected to take center stage. What are you waiting for? Join the foodie wanderlust at Cha Cha Ko now! For those who’ve been to the land of the rising sun, you would know that Japanese izakayas dish out sinfully delicious bar nosh. And, this izakaya nestled in Kovan is no exception. Tachinomiya lives up to the izakaya reputation of serving indulgent grilled finger foods paired with cold pints, rich sake, and smokey whiskeys. Opened till midnight and even till 2am on Saturdays, Kovan barflies now have no qualms for your next late-night peckish liquor run. Casual and cosy, Tachinomiya is in the running to be the go-to hangout for great suppers and affordable drinks. Click here for more information on Tachinomiya. If variety is the spice of life, then you will never be bored here at Curry Nations. Breathing life into authentic Indian recipes, you can expect to be pleasantly surprised by innovative yet still uniquely Indian-rooted meals. Inspired by Mangalorean cuisine — heavily influenced by its South Indian counterpart — coconut and curry leaves are the hallmarks of the delicacies here. Hints of garlic, ginger, and chilli will invigorate your senses as you dig into the Mangalorean Fish Curry, whereby the fish is made fresh and available seasonally. Disneyland, Tomorrowland, and Duckland. Yes, you didn’t read it wrong. Duckland has it all with duck-inspired plates from all around the world. Specialising in all-things duck, lovers of the quacking bird will love this Irish farm-to-table concept restaurant in United Square. If Disney is the happiest place on Earth, then Duckland would be best flavour theme-park for you duck-lovers. It’s really a seafood paradise with some of the freshest ocean catches complemented with the idyllic, rhythmic crashing of the waves onto shore. All that strolling along the beach while the salty sea breeze gushes at you may have given you a bit of the chills. Start by warming yourself up with the Four Treasures Soup, a hearty bowl of hot soup simmered for hours to give that deeply, robust flavour. Then, prepare your palate for generous zichar-style courses fit for any kind of group gatherings. A bright and spacious lounge-setting welcomes you for a sensational dining experience. Your food adventure takes flight with Chef Leung’s creative culinary cooking. Take the Singapore-style Laksa for instance. A homage to the local delight, the famed chef introduces his own twists on the humble hawker fare. Drenched in a rich, heavenly gravy, Chef Leung’s laksa rendition of smokey tea-braised quail eggs and crusty tiger prawns will have you slurping till the last spoonful. Also along Stamford Road, grace a homely German boutique with your presence. The ambience here is specially curated for different occasions — Frieda’s Day Bar exudes an urban Berlin vibe for cold drafts over casual meetings; the Dining Room’s cosily intimate interior relaxes the diner for an evening of hearty dinners; lastly, Frieda’s Garden charms the unassuming with its enchanting backdrop of flora and fauna. The beautiful decor may entrance you the moment you enter, but the delightful German fares are the ones that will have you completely captivated. 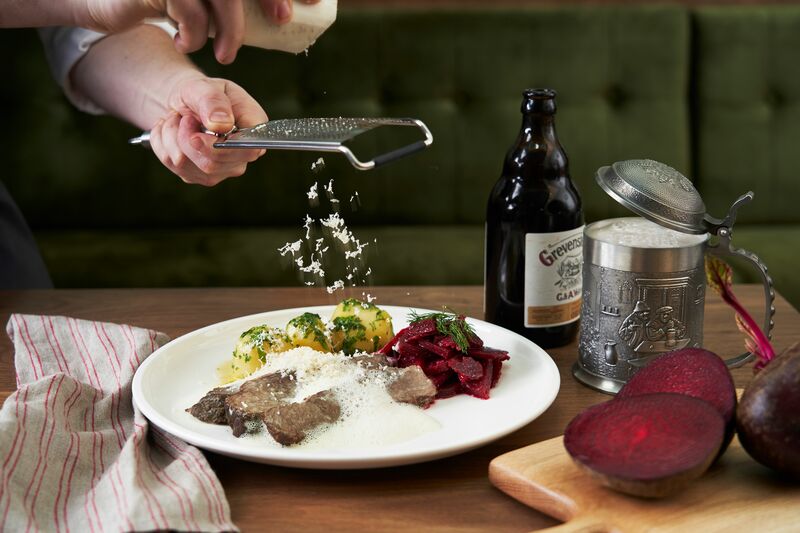 Frieda boasts a German mainstay, the Traditional ‘Wiener Schnitzel’. A crispy, breaded veal seals the deal with a perfect flavour blend of a light and refreshing cucumber-dill dressing coupled with sweetly tangy cranberries. You might be wondering where Flavours at Zhongshan Park has disappeared to but not to worry. The five-year-old establishment steps into a new skin as New Ubin Zhongshan Park. Serving up Singaporean dishes like the Boss Hokkien Mee, be sure to stop by for local delights infused with modern twists. Hey, if you’re having a crappy day, turn that frown upside down with a free crab! You’ll get the third crab free with any purchase of two 500g crabs. Simply Chope at any New Ubin outlet and key in ‘2-for-1 Crab Promo’ to get your crab on the house!